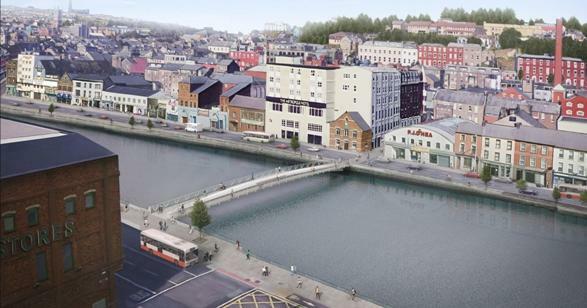 Cork City Council has awarded the contract for the construction of the Harley’s Street Pedestrian & Cycle Bridge to L&M Keating Contractors. The bridge will link the city centre and Victorian Quarter; it is expected to be used by up to 11,000 pedestrians and cyclists a day. The initial phase of construction work will consist of setting up the site and diverting underground utilities. The bridge itself will be fabricated off site by Thompsons of Carlow between now and February 2019. Bridge sections will be transported by truck to the lower harbour for final assembly and finishing. The finished superstructure will be placed on a barge and transported by river to the city centre. The barge journey will be timed to coincide with the optimum tide level for clear passage under Brian Boru Bridge before arrival at its final destination in the city centre in April 2019. The bridge will be lifted by crane from the barge in one overnight operation.